This year's Rainbow Project Draw paired us up with Sante Adairius - located in the coastal city of Capitola, CA, just south of Santa Cruz. For the first time, each pairing was drawn two colours this year. We received Blue for 2017 (which we've had once before, brewing Blue Sky, Blue Sea) followed by Violet for 2018. We bounced around a lot of ideas before finally settling on ice and fire as our theme for the two beers. Blue represents our ice, a cold fermented beer that can be blended with a warm fermented beer in future (red) - to give our barrel aged Violet. So, a cold fermented beer. The Rainbow Project has often seen brewers pushing themselves creatively. This has quite often been through the use of outrageous ingredients, unusual styles or high-concepts that wouldn't otherwise see the light of day. Santo del Frio is a dry-hopped American Lager, which perhaps doesn't tick any of those boxes. But we don't brew lagers, and we're quite prone to using outrageous ingredients, trying out unusual/hybrid styles and brewing high-concept beers. So it's a step in a new direction for us! We wanted to be careful not to stretch it to the point that it wasn’t a lager. 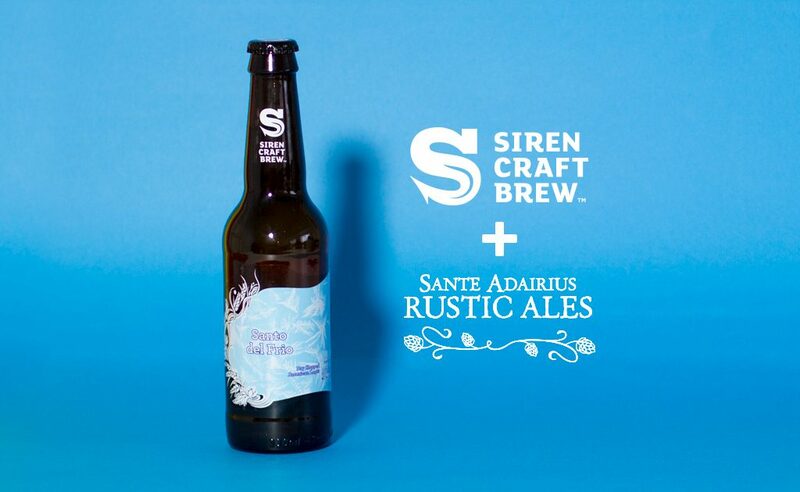 So Santo Del Frio is at its heart, a well hopped lager, however with Sante Adairius and Siren getting together we couldn’t just leave it there. For the first time we're using blue agave syrup aged in our own Tequila barrels. This is joined by blue corn tortillas in the mash (continuing the hot/cold Mexican theme).Yeast choice was going to be critical, so we went with a yeast that Sante Adairius use for all their lagers, flown in from the sunnier climes of Calfornia. American Lager Yeast from Giga is a super clean and dry with minimal sulphur yeast. We can't wait to hear what you make of it! Where to find Santo del Frio... We're taking the Rainbow Project on tour this year! Here's where the beers will be available: 7th - 10th September: Leeds International Beer Festival Friday 8th September: Hawkshead Beer Hall 8th - 9th September: The Beavertown Extravaganza 15th - 17th September: Bristol Craft Beer Festival 29th Sep - 1st Oct: Independent Manchester Beer Convention We're also putting together 2,000 mixed cases this year, which will include all 7 collaborations and a Rainbow Project 2017 souvenir glass. The bulk of these will be launched with our online partners HonestBrew on Saturday 9th September. They will also be available from bottle shops around the country.